Chinese President Xi Jinping speaks during an event to commemorate the 40th anniversary of the Message to Compatriots in Taiwan at the Great Hall of the People in Beijing on Wednesday. Xi urged both sides to reach an early consensus on the unification of China and Taiwan and not leave the issue for future generations. 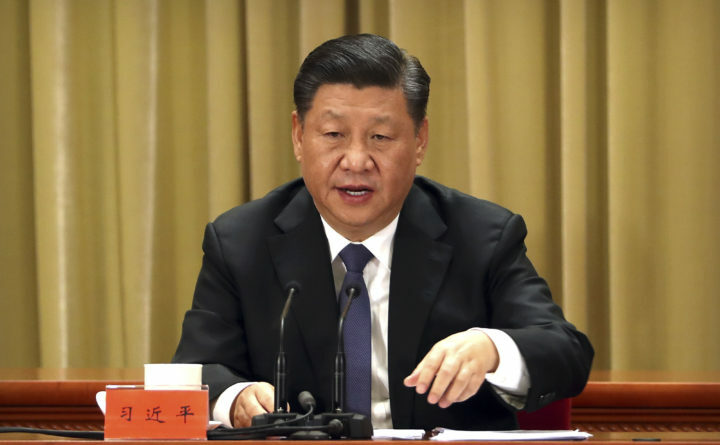 “Independence for Taiwan would only bring profound disaster to Taiwan,” China’s president, Xi Jinping, said in Beijing on Wednesday, and he ought to know. He is the one who would make sure the disaster happened. On the other hand, the regime’s credibility (such as it is) comes from only two sources: its nationalist posturing, and its ability to deliver rising living standards. With the latter asset rapidly depreciating — the Chinese economy is heading south — the nationalism becomes more important, so a bit of chest-beating is inevitable. The U.S. agreed in 1979 that there is only one China, and that it includes Taiwan. There just happened to be two rival Chinese governments at the time: the Communist one in Beijing that won the civil war in 1949 and has controlled mainland China ever since, and the previous Nationalist government that retreated to the island of Taiwan when it lost the war. Both of these governments agree that there is only one China. In practice, the one in Taipei can never regain control of the mainland, but it claims to be the legitimate government of China, not of Taiwan. Almost everybody else, including the United States, agrees that there is only “one China” and recognizes the Communist regime in Beijing as legitimate. The 1979 deal assumed that this conflict would be resolved peacefully at some unspecified future time, and Beijing made some helpful comments about how Taiwan could enjoy a special status if it reunited with the motherland: democracy, a free press, the rule of law — the same promises made to Hong Kong when Britain returned it to China in 1997. Then everybody settled down to wait for time to pass and the generations to roll over. Beijing assumed that the Taiwanese would eventually see the light and rejoin the mainland. The Taiwanese assumed that Communist rule on the mainland would eventually either mellow or just collapse. Either way, we’ll all just get on with our lives in the meantime. It was a very sensible, moderate deal — but those assumptions proved to be wrong. Communist rule in China has not collapsed, and Xi is the most powerful and authoritarian leader since Mao. Taiwan has not grown resigned to reunion with the “motherland”; on the contrary, a separatist Taiwanese nationalism has grown stronger with the years. At the moment, in fact, the party in power in Taipei is separatist, though it is careful not to say so explicitly. It can never happen: China has 1.3 billion people, Taiwan has 23 million. Taiwan’s president, Tsai Ing-wen, takes positions that appeal to the local nationalist and separatists, but she’s never going to declare independence. Xi threatens bloody murder if she declares independence, but he knows that she will never actually do that.